Three generations of Americans who have been enticed by ads in the back of comic books, have grown up nurturing, naming, and staring goggle-eyed in fascination at the little flecks whose resemblance to monkeys requires a little imagination. To von Braunhut, 72 years old and preternaturally brimming with imagination, it's right there plainly before your eyes. After he introduced his creatures in 1960, then named Instant-Life (which really does occur, through a highly guarded interplay of osmosis, and controlled pH fluctuation), he began marketing the kit under that name. But while Instant-Life smacks of drama, it wasn't until he noticed the little shrimps' tails that he had his decade-spanning, iconic moniker. "I looked at these animals and they're the cutest things in the world and I noticed they have little monkey-like tails," von Braunhut relates in his thick New York accent. "I said, "Those are cute little sea monkeys.' So we checked the trademark register with my patent attorney, and he says, 'Hey there are no sea monkeys.' That was in 1964." By then, von Braunhut, who had been ridiculed for his "not just crazy, but absolutely insane" Sea-Monkey idea, had found modest success with his grass-roots marketing. But while von Braunhut had been able to master the instant life process with the help of a marine biologist at the New York Ocean Science laboratory in Montauk, N.Y., he was still having a little trouble with the monkeys' longevity. It was rare that the little fellas lived to see the end of their first month, and consumers were getting frustrated. But like the shrimp, Latin name Artemia Nyos, whose eggs can lie dormant in salt flats with the spark of life intact awaiting the right conditions, Sea-Monkeys were indomitable, alternately prospering and waning, being out of vogue, and then springing forth again. Throughout von Braunhut and his partners worked diligently, placing financial returns back into research. This led to two refinements, one in 1970 and one in 1995, which have resulted in a larger, hardier and haler Sea-Monkeys. Almost Sea Apes. So hardy, the packaging now boasts they're absolutely guaranteed to live two years. The company too is faring better with the partnering of ExploraToy, a southern California company who bought licensing rights in 1995. This year saw the release of a flashy new phosphorescent tank for the Monkeys called the Ghostly Galleon, and the next two years will bring the release of both a nostalgia kit and a special millennium pack. "It's really a priceless brand name," says George Atamian, vice president of ExploraToy. "We just got a very nice hand-written letter from a young girl who just did a Sea-Monkey project at school, and she went on to describe at great length why she loved Sea-Monkeys. They're totally friendly, they don't eat each other, they're total herbivores, they grow, they mate, and they have babies." These features, coupled with our voracious appetite for nostalgia, has fueled an explosion of interest. TV shows, electronic media, and more leveraging of the brand name is happening apace. 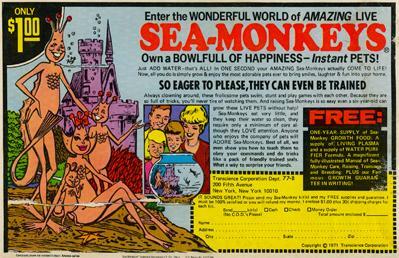 Sea-Monkeys, their packaging claims, have even traveled on two successful space missions for lab research. But for Von Braunhut, it's not enough. He always meant to go further up the evolutionary scale than the diminutive critters. Remember the hermit crab craze of the 1980s. That was him, marketing the little crustaceans as Crazy Crabs. He holds almost 200 patents to his name, (including another comics favorite, the X-Ray Spex) and has been tinkering for years at his Maryland conservatory to introduce a new strain of pet lobster, an Instant Frog, and a strange "bear-like creature that survives dried up for decades without food, water or oxygen, yet revives, walks and feeds when just a drop of water touches him." For now, these remain in the realm of research. Von Braunhut's lobster strain hasn't been as consistent as he demands one of his creations be, and so he's back to the lab. He is a somewhat changed man, however, for having worked so closely with a higher life form. "Our pet lobsters, they'll rap the side of their tank with their claw, to tell you to get something for them to eat," von Braunhut laments. "That's why I got ruined, absolutely ruined for eating lobster." Despite the fact that shrimp made him famous and brought in millions of dollars, langoustine and prawns are not accorded the same respect. He still eats those "occasionally, just occasionally," he says with a chuckle in his voice. "But I always eat them with guilt."